Winner of York Tourism Awards for Excellence Guest House of the Year 2008. 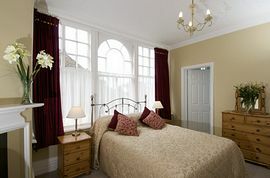 Carlton House is a privately owned, recently refurbished Bed & Breakfast within an elegant Georgian town house; we have 13 bedrooms all with en-suite shower rooms located over 3 floors. Situated on the tree lined Mount, gateway to the City of York and just outside the Roman wall, we are within walking distance of the railway station, racecourse, numerous excellent restaurants and all major tourist attractions. 10 mins stroll from city wall to city centre. All rooms have, remote colour TV, hospitality tray, tourist information pack, hairdryers, radio alarms and free WiFi throughout. Private on-site car park to rear and off road parking. The building is a 4 storey 1830s Grade 2 listed property; there are stairs and unfortunately we do not have a lift. If you have difficulty with stairs, please request a lower floor room at the time of booking and we will do our very best to accommodate you. Take the A1 onto the A59 and on the outskirts of the city, you will cross the A1237. Follow that road into the city, until you come up a hill to an iron railway bridge. Turn right after the bridge onto Dalton Terrace. At the traffic lights turn left and the guest house is 100 metres along on the left. Come into York on the A64 York-Leeds road. On the outskirts of the city take the A1036 signposted York West. After a mile you will pass the racecourse, which will be on your right. There is then a slight hill with traffic lights at the top, go through the lights and the guest house is 100 metres on the left hand side. Turn right and follow the footpath round the city wall until you come to the cross roads. Turn right at the junction onto Blosson Street. After approx 300 metres you will pass a Sainsbury Minimart, just beyond here the road changes name to The Mount. We are a further 200 metres on the right hand side after the Quick fit garage. Open all year round except Christmas & New Year. York Tourism Awards for Excellence Guest House of the Year 2008.